Some expeditions, of course, attempt to set new records. Others focus on scientific discovery. But those that serve to directly benefit the impoverished, the underprivileged and the desperately ill deserve special recognition. 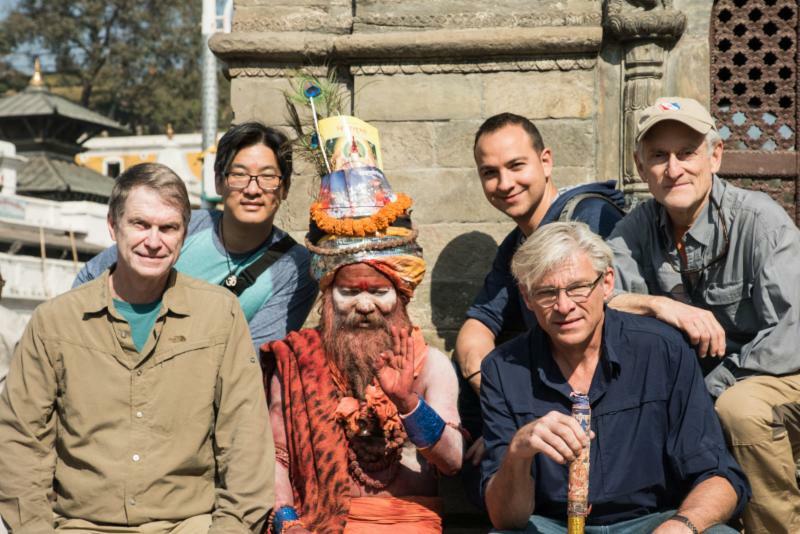 Dooley Intermed International, the New York-based non-profit that delivers quality medical care "at the end of the road and beyond," will once again travel to Nepal in October with a team of leading ophthalmologists. Their destination is Western Nepal - the Gumghadi, Mugu District, on the border of Tibet. It's considered the most remote region in Nepal, and among the least developed. The team, assembled by Scott Hamilton, president of Dooley Intermed, and Dr. Ronald C. Gentile of Operation Restore Sight, will depart in early October on a two-week mission involving members of the elite Operation Restore Sight team. This latest medical expedition to cure blindness represents Dooley Intermed's sixth sight restoration medical mission to Nepal in eight years, according to Hamilton. (See EN, January 2018). An advance team from Himalaya Eye Hospital and the Pema Ts'al Sakya Monastic Institute will depart from Pokhara, Nepal (about 130 miles west of Kathmandu), on a multi-day four-wheel-drive journey into the Himalaya to reach the Mugu District. Tri-lingual monks from the monastery have volunteered their services as translators and eye camp assistants. The Dooley-Operation Restore Sight surgical team will then travel via chartered Twin Otter aircraft to the remote 1,500-ft. Talcha airstrip located at an elevation of 9,000 feet. From there the eye doctors will journey along a mountain trail to Gumghadi village, meet up with the advance team, then begin the multi-day eye camp, providing comprehensive eye examinations, refractions, eyeglasses, medical care and sight-restoring surgeries. "All medical care, eyeglasses, medicines and surgeries will be provided completely free of cost to everyone in need," says Dr. Gentile. Cataract surgery is one of the most cost-effective and gratifying surgical procedures in medicine since patients are "cured" overnight, often with full restoration of their eyesight. In 2013 and 2017 members of the same team restored sight to more than 150 villagers in Nepal's remote Mustang and Gorkha regions while providing quality eye care and refractive services to over 1,500 patients. The Dooley Intermed - Operation Restore Sight team also participated in the construction of a new Eye Hospital in the Kavre District of Nepal, a region that suffered massive damage in the 2015 Nepal Earthquake. In a famous scene from The Graduate (1967), "Benjamin Braddock," played by Dustin Hoffman, receives some career advice at a party. "There's a great future in plastics," he's told. That may be the case, but plastics, particularly microplastics, have become the scourge of the marine environment worldwide. One group has been marshalling outdoor explorers and adventurers to study the problem in great depth. From 2013-2017, Adventure Scientists, based in Bozeman, Montana, mobilized thousands of trained volunteers to help identify the extent of microplastic pollution in marine and freshwater systems around the world. Results have revealed microplastics in the vast majority of marine samples collected, from places including Maine, Alaska, Argentina, Thailand, and Antarctica. Pollutants including pesticides and manufacturing chemicals can adhere to microplastic particles and bioaccumulate in aquatic life. Microplastics have been shown to affect feeding behavior and predator avoidance, and can interact with other pollutants to affect cell function in fish. They're also able to move from the digestive tract of organisms into the bloodstream, according to Adventure Scientists. The Global Microplastics Initiative utilized a network of trained volunteers to collect water samples across the world's oceans, rivers, lakes, and streams. Approximately 1,000 volunteer-led expeditions collected 2,677 water samples over four years and spanning each continent and every ocean. It has resulted in the most diverse and the largest known dataset documenting microplastic pollution on a global scale. The news is not good. On average, global water samples contained 11.8 pieces of microplastic per liter. Open ocean samples contained on average higher concentrations of the pollutant than did coastal samples, with polar regions containing the highest averages. Across studies, microfibers, as opposed to other types of microplastics, were dominant: microfibers composed 91% of marine particles, and 92% of freshwater particles. Through partnerships and targeted outreach, data are being used by governments, organizations, and industry to address the environmental issue of plastic and microplastic pollution. Kick Scooters for Charity. That's Bex on the left. Londoners Bex Band and Gil Drori just completed a 1,750-mi. journey traveling the full length of the western U.S. using kick scooters - stand-up non-motorized scooters that are powered by leg muscles alone. The expedition, named "Kicking the States" began on May 17 in Vancouver, Canada and recently ended in Tijuana, Mexico. Their goal was to raise money to help build a school in Tanzania. They averaged 30 miles a day carrying gear on their scooters. "Wilderness is a ferocious intoxication that sweeps over your senses. It is an untouched place that leaves you elated, awed, and changed. It is an aphrodisiac, a place of furious, ripe fullness." - Jay Griffiths writing in UTNE Reader, January/February 2003. Griffiths' writing has appeared in the London Review of Books, The Guardian, The Observer, The Ecologist, and Resurgence, of which she served as associate editor. 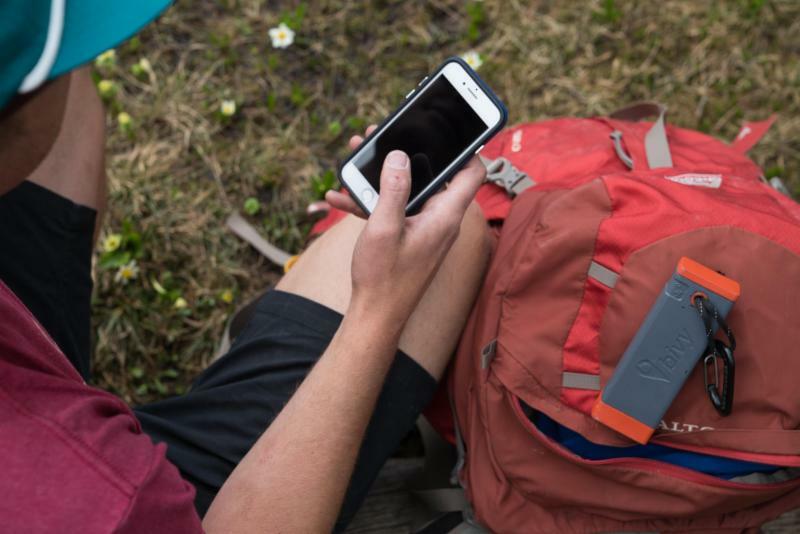 While thousands of outdoor retailers converge on Denver for the annual Outdoor Retail Summer Market looking for products that will enhance their profitability, we attend for other reasons, and not just for the free water bottles and ballpoint pens. We attend to search of the more unusual products. Some are perfect for expeditions, others not so much. "Consumers are all about multi-sport now. 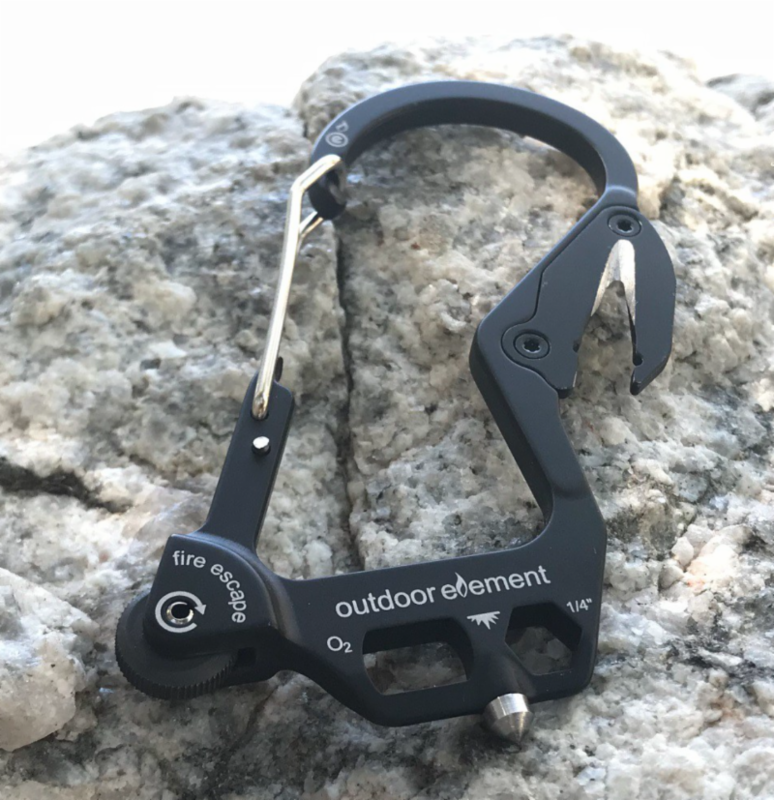 And gear is following suit: versatility rules and hybrid products are increasingly designed with multi-purpose functionality," writes Aaron Bible in Outdoor Insight magazine (August 2018). The FireEscape - just don't bet your life on it. Squeezing the simplicity out of a camp lantern. Cold hands or dead phone. You decide. 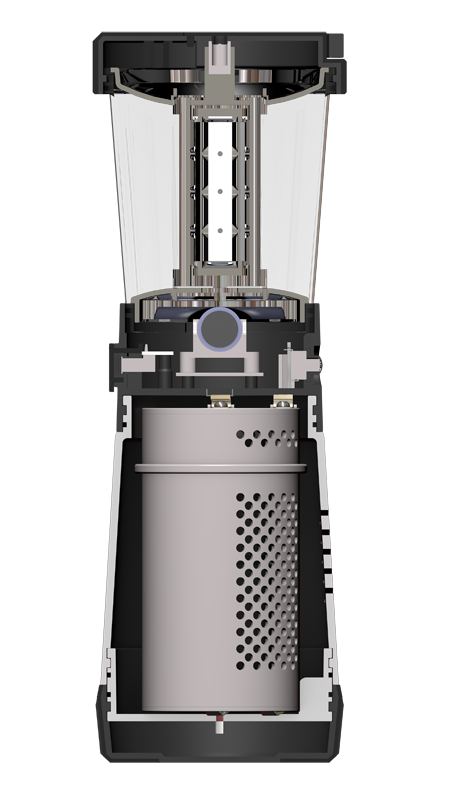 * Zippo Rechargeable Handwarmer ­- What do you do when you make cigarette lighters and the world turns against you? 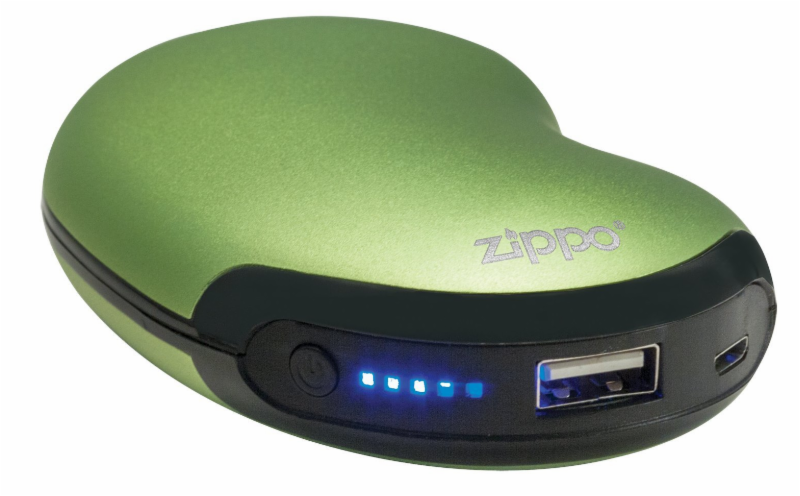 Naturally, you make rechargeable handwarmers that can also charge your sorry dead iPhone. It will heat for 120 degrees F. for six hours. Or charge your USB compatible devices. Except not at the same time. So the choice is yours: cold hands or no phone. Silly question. $44.95, www.zippo.com. Love it. Want it. 'Nuff said. * Tailgater Tire Table - Definitely drool worthy. No fancy brand names here. Simple directions. No cutting edge technology or anything fancy like that. This one speaks to us. During a recent hiking trip to the French resort of Chamonix, the EN staff was happy to see how well the city embraces its climbing history. Site of the first Winter Olympics in 1924, this picturesque town of 8,900 is located in a valley on the north side of the summit of Mont Blanc, at 4808.7 m/15,777-ft. it's the highest European mountain west of Russia. Nearby is one of the highest cable cars in the world, which links the town to the summit of the Aiguille du Midi at 3842 m/12,605-ft.
French resort city honors its famed guides and mountaineers. There are free telescopes in town pointed at the high point, and signs honoring the first ascension on Aug. 8, 1786 by Jacques Balmat (1762-1834) and Doctor Michael-Gabriel Paccard (1757-1827). 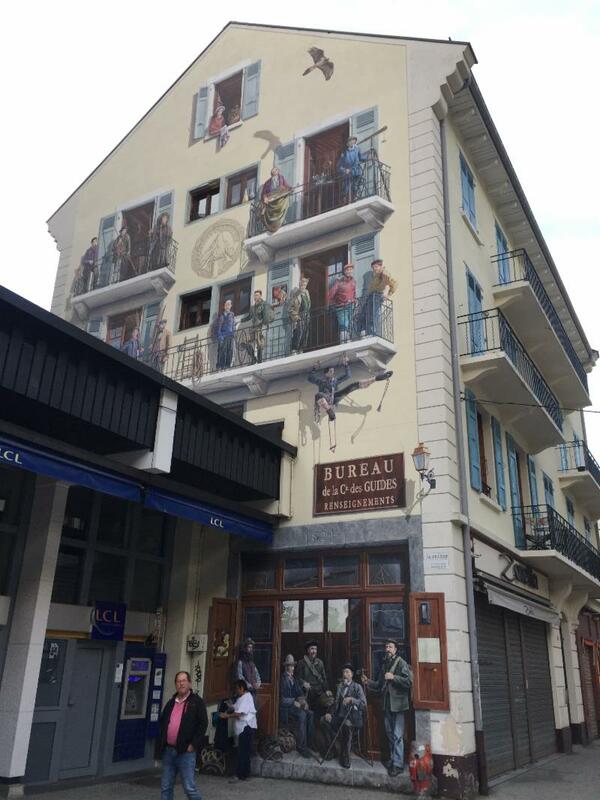 Best of all is a huge fresco devoted to the "Mountain Guides of Chamonix" located on the entire end wall of a property on the Rue du Docteur Paccard, close to the center of Chamonix. 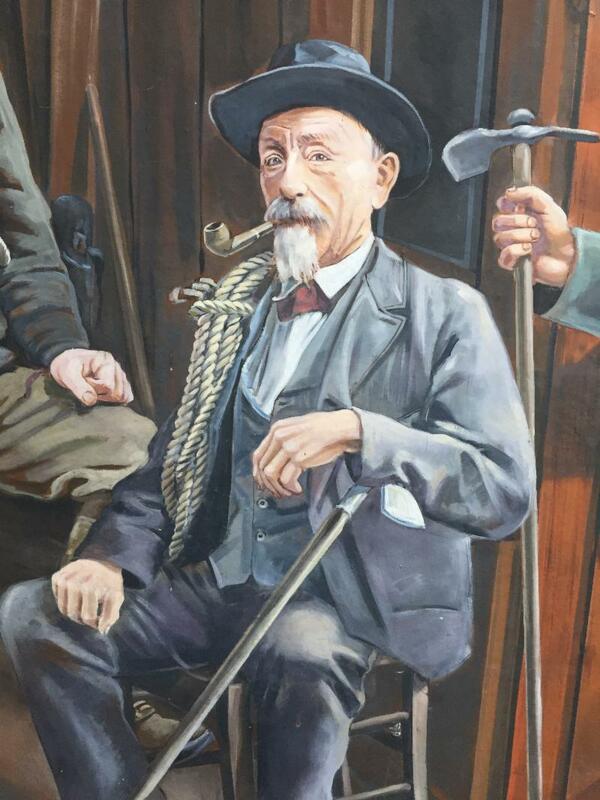 Created in July 2010, the mural features 20 of the outstanding pioneering guides and mountaineers associated with Chamonix and Mont Blanc. 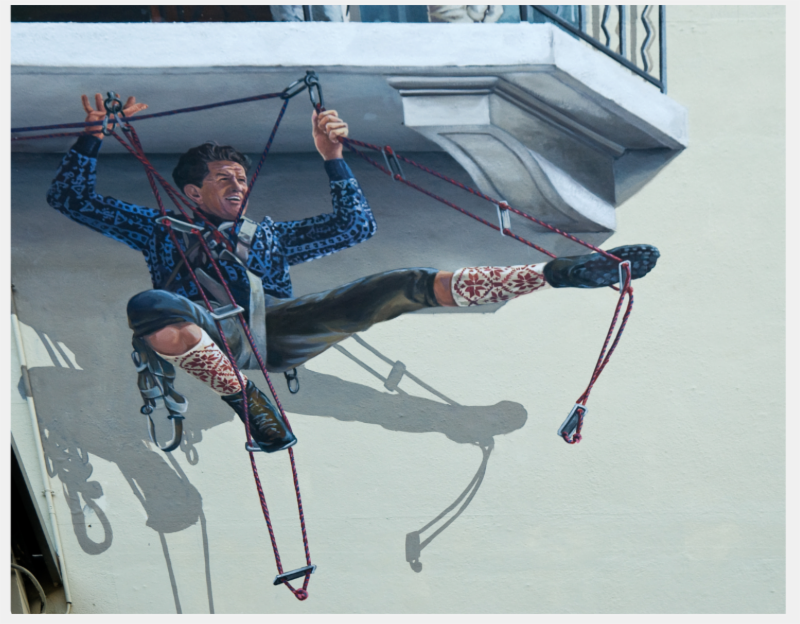 It's a trompe l'oeil on a grand scale. Go for the hiking, go for the French cuisine, and go for a look at the early days of climbing almost as old as the United States itself. 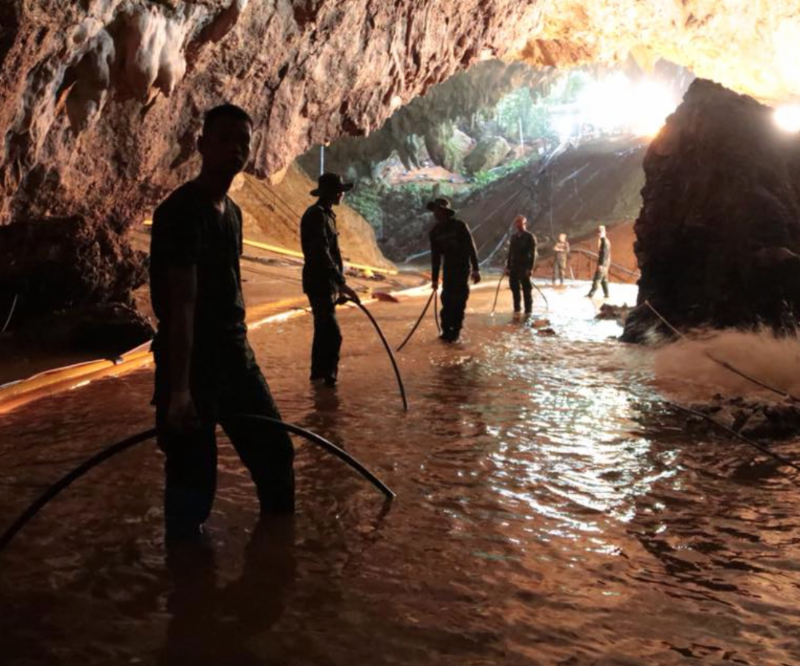 Bill Steele, the cave explorer we've covered in past issues of EN, provided his thoughts about the Thai soccer team, ages 11 to 16, and their coach trapped inside a cave in Mae Sai, northern Thailand. He writes in the July 6 Washington Post just prior to their successful rescue on July 9-10, "What I have learned, since I started exploring caves as a 13-year-old Boy Scout 55 years ago, is that caving absolutely requires you to adhere to the Boy Scout motto: Be prepared. Rescue scene from Royal Thai Navy Facebook page. "The Thai boys and their coach obviously were not prepared with supplies in case of an emergency. They were not prepared with proper gear such as helmets, each person with a dependable light (or three, like we carry), boots and so on. They did not heed a warning sign at the entrance about the cave being prone to flooding during a rainy-season downpour." Steele continues, "Caving means taking a calculated risk. I also drive. I've been hurt worse in traffic accidents than in caves. I still drive, and I still go in caves." He calls caving, "an exhilarating opportunity to pursue pure exploration on the planet Earth, which isn't so easy to do these days." Moments of crisis can upend our lives, but can also help define them, according to NPR. TED speakers, including 1996 Everest doctor Ken Kamler, explore how a quick, compassionate or unexpected response can turn crisis into opportunity. It's a rerun hosted by Guy Raz on Aug. 3 of an earlier interview with Kamler. Big Agnes, the Colorado gear manufacturer whose designers take their inspiration from "sleeping in the dirt," invites applicants to apply for the company's Bob Swanson Memorial Grant. It's named in honor of Bob "The Tent Guy" Swanson who co-founded Sierra Designs, founded Walrus tents, then sold that to REI and followed it up by working for REI for several years before going out on his own as a consultant for Big Agnes. Applicants, age 18 and up, must describe how their proposed adventure will push new boundaries in some way, use creative problem solving to overcome unique challenges and help them grow as an individual. Approximately two to three months of returning from the project, all grant recipients will be required to submit a trip report. 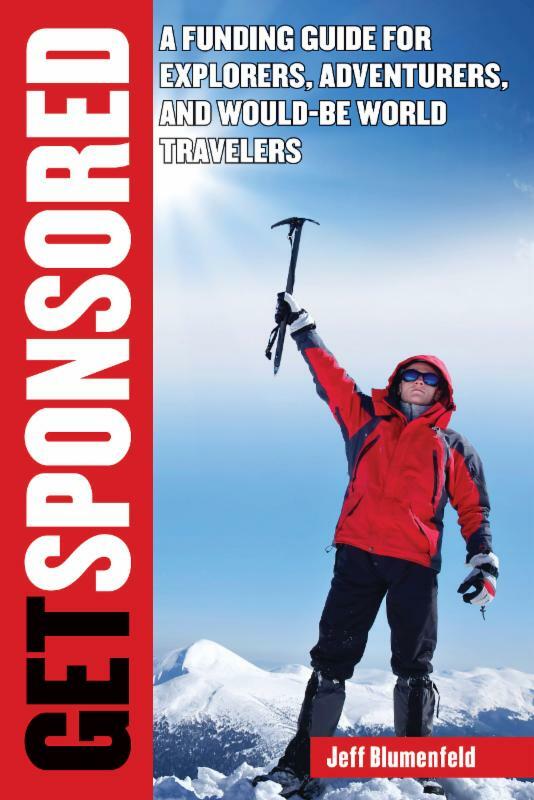 Successful applicants receive Big Agnes, Honey Stinger and/or Helinox products. Application period is Oct. 20 through Dec. 17, 2018. The Explorer II, Explorer, and Submariner will be a part of the Expedition Watch Program. We'll take two. Rolex is offering up three watches to be taken on expeditions and put in harm's way. But there's a catch: you have to be an Explorers Club member, according to an Aug. 7 story in Hodinkee, the website for watch geeks. Jason Heaton writes, "Rolex has been a supporting partner of The Explorers Club for decades and, in addition to financial support through event underwriting and grants, has provided three watches to be worn on expeditions: an Explorer (duh! ), an Explorer II, and a Submariner. These watches are the subject of what is being called the 'Rolex Expedition Watch Program' and will piggyback on existing flag expeditions." Watches will be awarded to worthy expeditions, based on detailed applications submitted to a selection committee. 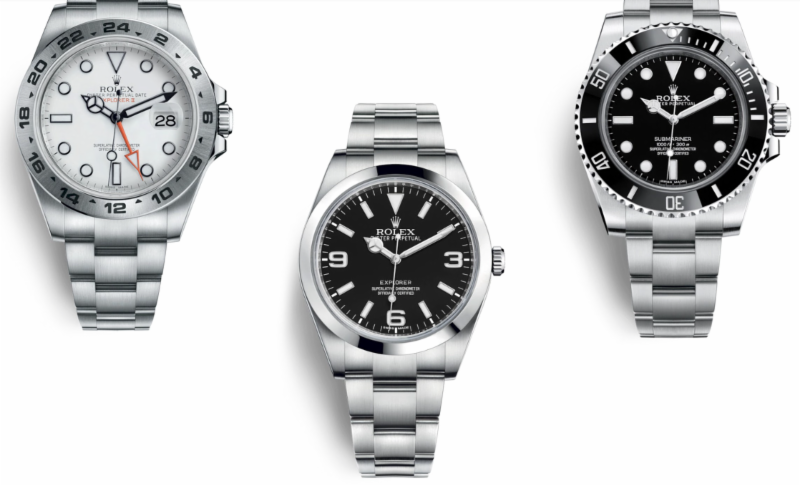 Heaton continues, "As part of the Expedition Watch Program, each selected expedition leader will wear the chosen Rolex for the duration of their mission, capturing photographic evidence of it for posterity and then returning the watch to the Club. Rolex will engrave the back of the watch to commemorate each expedition, a plaque will keep a running history of each watch's use, and then the given watch will remain at the Explorers Club until the next assigned expedition. Like the flags, each watch will eventually be retired after a number of expeditions to be left on permanent display at The Explorers Club." "I get the sense that many of us feel it's corny to admit that we're inspired by stories of adventure. But I think it's magical to allow oneself to imagine walking on the moon with Buzz Aldrin while staring at their Speedmaster (editor's note: an Omega product), or be inspired to get scuba certified after reading one of Mr. Heaton's watch reviews (particularly the one with Sylvia Earle). This is part of the 'emotion' of watches that people keep talking about-I, for one, am inspired to go out and feel it for myself." Alex Martin, 18, is putting Gearlab paddles to the test. 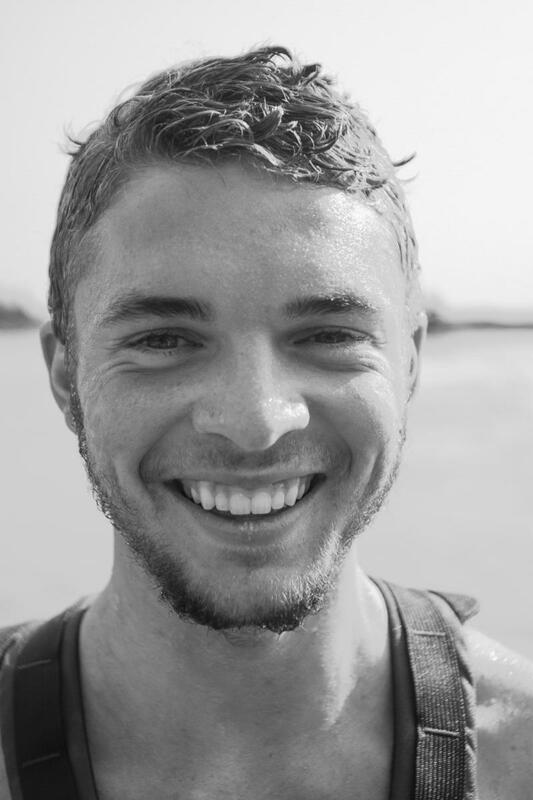 Winnipeg kayaker Alex Martin, 18, is on a first of its kind solo expedition to circumnavigate Lake Winnipeg, 34 miles north of Winnipeg, Manitoba. The goal during the 1,750 km (1,087-mi.) sea kayak journey is to raise awareness about the critical need for sustainable watershed management in the region. The adventure kicked off June 27. At press time in early August, Martin was about to complete his journey. Along the way, Alex sopped in communities around the lake to share stories, promote the campaign, and photograph the lake along the coast. Lake Winnipeg is the largest lake within southern Canada's borders, and is part of the most undeveloped large watershed of southern Canada. The lake is 416 km (258 mi.) from north to south, with remote sandy beaches, large limestone cliffs, and many bat caves. The lake's east side has pristine boreal forests and rivers that are being promoted as a potential United Nations World Heritage Park. 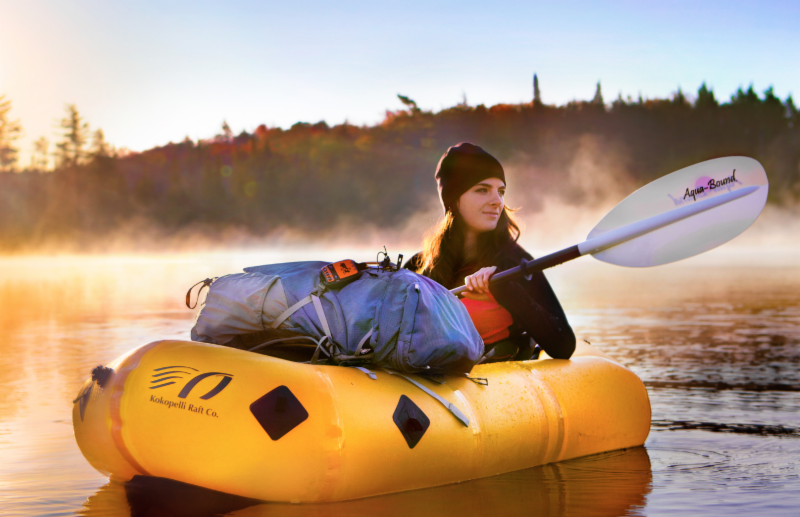 Sponsors include Gearlab, makers of the Nukilik, modern Greenland-style carbon fiber paddles with exchangeable tips. Greenland paddles are said to allow kayakers to travel farther with greater efficiency and precision, while reducing injury and fatigue. Martin has been feeding the Taiwanese company product reviews along the way (www.gearlabpaddles.com). While Lake Winnipeg was circumnavigated by a duo of adventurers in 1983, Alex's solo trip is reportedly the first known solo expedition. His trip is being tracked via Garmin inReach. Winners of The Explorers Club's prestigious Lowell Thomas Awards this year are Harvard Professor of Organismic & Evolutionary Biology Peter Girguis; Aerospace biomedical engineer and space suit designer Dava Newman; groundbreaking Egyptologist Sarah Parcak; Principal Investigator of NASA's New Horizons Pluto Mission Alan Stern; and Nobel prize-winning physicist Rainer Weiss. The 2018 theme is "Engineering Exploration." According to the Club, all have demonstrated the skills necessary to engineer groundbreaking expeditions and expeditionary science. The Lowell Thomas Awards were first presented on the occasion of The Explorers Club's 75th anniversary, October 17, 1980, to a group of outstanding explorers including Carl Sagan, Isaac Asimov, Sylvia Earle, and Lowell Thomas himself.